As reviewed in The Armourer, April 2019. You'll be £32.00 closer to your next £10.00 credit when you purchase D-Day - Cover Up at Pointe du Hoc. What's this? 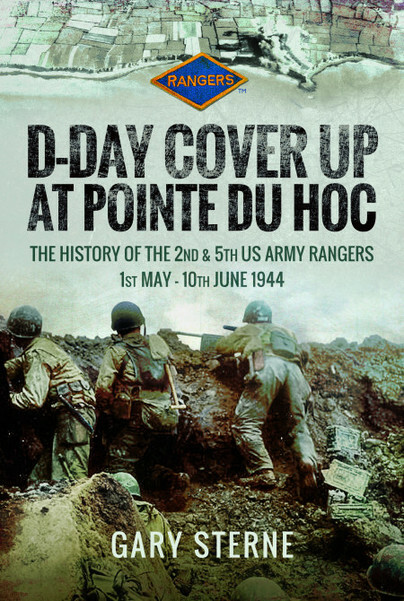 The author has my unreserved admiration as it is perfectly clear just how much time and effort he has invested into this volume which completes the story of the 2nd and 5th US Army Rangers at Pointe Du Hoc. The level of detail to which Sterne goes to is quite incredible. There are literally pages and pages of documents (in their original format) with a superb collection of maps as issued for planning and photographs from training and the operation. These all help build his case and prove his points with great clarity and skill but can be wearisome to read through, especially as Sterne then refers to key sections expecting the reader to have read them. This book is extremely interesting and chock full of great documents! I think it is a must have for any and all WW2 D-Day ‘fans’ and researchers, no matter. Very much recommended !!! For the first time ever this follow-up book now offers complete Rangers history for the seven months prior to D-Day and does so using period documents, many of which have only recently been released from TOP SECRET status in US Archives. The author fills in the gaps that many have only guessed at concerning the Rangers' real missions on D-Day, he explains why a battalion commander was removed hours before the landings, why the Rangers were not briefed on their actual D-Day missions and the extraordinary role that Lt. Col. Rudder played at Pointe du Hoc. This book is a historical game-changer that pulls no punches. and overturned a number of previously accepted historical views. No punches have been pulled and this will become a standard work to benefit future historians, containing very detailed primary source material that has just become available after some 70 years of restriction as TOP SECRET material. Gary Sterne is a keen collector of militaria and was a co-founder of The Armourer and Skirmish Magazines. He has always been fascinated with the D-day landings and in particular was intrigued by the lack of precise information relating the mystery of the "missing guns" of Pointe du Hoc. His research led to the finding of a map which indicated the position of an "unknown" German gun position buried in the village of Maisy. After buying the land and some years of struggling with the French authorities, he was able to open the huge site to the public. The re-discovery of the Maisy Battery made headline news around the world and has subsequently changed the history of the Omaha Sector forever. The site is now one of the major Normandy D-day attractions.